Similar problems usually occur if the program is blocked by antivirus and/or firewall software. We suggest you add TO3000 to a whitelist/trustlist of your antivirus and firewall software. Then try to launch TO3000 once again using administrator mode. 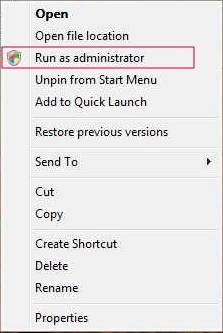 For this, right-click on the shortcut and select Run as administrator. You can also enter "Properties >> Compatibility" and check "Run this program as an administrator" so that the shortcut always launches it in Admin mode.